The Garcias impressively run JCG farm (which sells at SCCFM markets) and the Garcia Mexican Kitchen from which they serve delicious tamales, tacos, chiles rellenos, tostadas, sopes, quesedillas, tortillas, salsas, and more as one of the fine food artisans in our prepared food section. We are so fortunate to have them in our membership with one hand in organic agriculture and the other in a rich culinary tradition. Berenice, is very passionate about growing organically. She says this is due to both the health benefits and because it is the lineage that she and Jose come from in Michoacan, Mexico. Their grandparents farmed organically long before such methods had a name. Berenice has a reputation for a variety of delicious, typical Mexican dishes that highlight the freshness of their produce from the farm. She loves to cook and it shows in her creative specialties such as strawberry tamales. 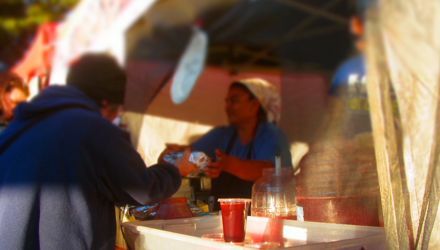 Other favorites include al pastor gorditas and chile relleno burritos as well as fresh made tortillas and tortilla chips. You can visit them at the Live Oak, Downtown and Westside Santa Cruz markets. Uniquely, the Garcia Family sources ingredients from their own organic farm, JCG, where they grow a variety of crops including cilantro, tomatoes, onions and berries. In addition to growing their own produce, the Garcias source ingredients from local and organic farms such as Live Earth, Route 1 and Pinnacle. JCG Farm is a 4-acre parcel located in Watsonville. On this small piece of land Jose and Berenice Garcia work the ground intensively, cultivating a diversity of fruits and vegetables that is rare to find in our modern times at any single farm, small or large. From row to row a visitor might stumble upon cilantro, raspberries, corn, watermelons, beans, chard, summer squash, the list goes on. Jose worked in the fields in Watsonville for 10 years before starting JCG farms in 2008 in partnership with his wife Berenice. Garcia says he chose to convert his business to organic practices because it was difficult to enter the local markets as a small conventional grower. The family moved to their current property in 2013 inheriting an old orchard of pear and apple trees which they will maintain alongside their beautiful, high quality row crops. They use biodegradable products as well as reusable "for here" plates.